In 1949 Alexander Walk was appointed at Chief Superintendent of Cane Hill, following George Lilley and Sir James Moody. He introduced several changes, including renaming the wards and introducing a badge for the hospital, to be awarded to staff that qualified from the nurses training school. Following the formation of the NHS in 1948, the General Nursing Council produced a syllabus for mental health nursing that was closely aligned with that of general nursing. Prior to this the RMPA was the primary body for nurse training, and although there was a small overlap, the RMPA ceased training in 1951. The Bottom Left section represents the Surrey Downs, which Cane Hill looked out over. The Bottom Right section is the Southwark cross, Southwark being the most prominent London Borough that Cane Hill served. Originals are now very rare, one recently sold on Ebay for £107. in 2007 a batch of replicas was produced and distributed, and a further batch was produced in 2009, of which one is pictured above. Subscribe to comments with RSS or TrackBack to '2.3. 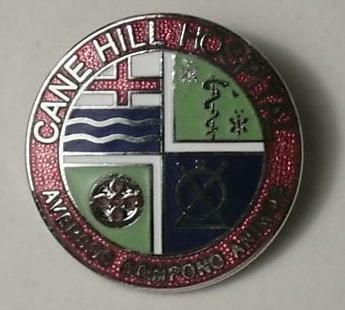 Cane Hill’s badge'. Glad you got this info up – I remember we were quite chuffed when we found it, I promptly wrote it down in a note book and haven’t found it since!! My Aunt was in Cane Hill from the 1950’s until it closed down in the early 90’s. I found it a terrifying place to visit as a child. But now I am fascinated by the place.